You can't say TV networks don't advance our scientific knowledge. Only a few weeks ago, for example, ABC succeeded in isolating a brand-new species of human being - the 10 o'clock actor. 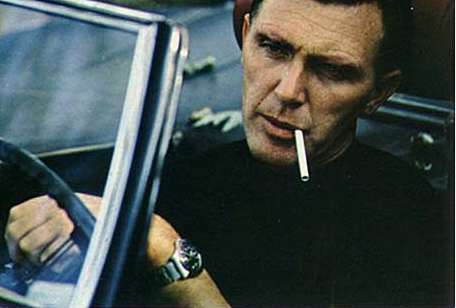 His name is Robert Lansing. As the star this season on ABC's 12 O'CLOCK HIGH, Lansing helped attract a large enough audience at 10 o'clock on Friday nights to give the show a respectable rating against its competitors - JACK PARR on NBC and SLATTERY'S PEOPLE on CBS. Accordingly ABC has renewed 12 O'CLOCK HIGH for another year - but Lansing will not be back. Reason: The show moves next season to the 7:30 Monday time slot, and (to continue the alleged logic of the unrevealed ABC executive genius) Bob is a warm, talented star only at the mysteriously magic hour of 10 P.M. Lest any reader accuse TV GUIDE of pulling his leg, Variety, The show business trade paper, offers testimony from 12 O'CLOCK HIGH executive producer Quinn Martin, who said at the time, "ABC is very high on Lansing, and asked me to find another series for him. They said they want him for a 10 P.M. show. Had we remained at 10 P.M. Bob would have continued." Ever since the story broke in print, Hollywood has been trying to figure it out. One observer speculated that the appeal to the 7:30 audience, which contains more juveniles, the show will have to feature more physical action, which calls for a younger star. That's sound reasoning - except that Robert Lansing is younger than the actor replacing him, Paul Burke. Another expert reasoned that the earlier audience will demand a more versatile star. Yet Lansing has starred in stage roles ranging from the lead in the farce "CHARLY'S AUNT" to heavy dramatic parts in plays by Eugene O'Neill and Tennessee Williams. Still another reason advanced was, "ABC does not feel the audience watching at that hour will identify with the lead character, a U.S. Air Force general. Consequently, Paul Burke has been signed on to star next season, playing a colonel." Being pigeonholed as a 10 o'clock actor - a classification previously undiscovered by students of the thespic art from Stanislavsky to Lee Strasberg - might be expected to enrage Lansing, especially since it meant losing an astronomical paycheck. But Lansing isn't angry. "I can't hate ABC," he says. "Hating a network would be like hating Dodger Stadium. Maybe I could be sore at the individual executive, but I have no idea who he is. My contract was with Quinn Martin, and he's the only man I've talked to. I can't be mad at Quinn either. He says it was the networks decision, and I have no evidence to make me doubt him." Yet when Martin offered Lansing the opportunity to remain with 12 O'CLOCK HIGH next season, playing Paul Burke's wing commander, a character that would be of considerable dramatic importance but would appear only occasionally, Lansing refused. "That's not what made me bow out," Lansing said. "When I realized what changes would be made in the show for that younger audience, I knew that 12 O'CLOCK HIGH couldn't be the same quality show next year, and 12 hours a day is too long to work at something you don't like." Lansing has already had offers for other TV series; but, at least for the moment, he is rejecting them. This is true to form; he refused quite a few before selecting 12 O'CLOCK HIGH. One series he turned down - according to Quinn Martin, not Lansing - was called THE FUGITIVE. "Once an actor stays with a series too long, movie producers loose interest in him. TV is great for a certain amount of public recognition. Then, if he can leave TV when he's riding high, he's in a position to make his move - the way Steve McQueen, James Garner and Rod Taylor did." "He's the most mature and professional actor I've ever met." says Frank Glicksman. "To prepare for this role of Brig. Gen. Frank Savage. Bob read everything he could find about World War II pilots, and interviewed as many as he could. He also became a pilot himself. Then he induced a psychiatrist friend to red the published diary of Gen. Frank Armstrong (the war pilot upon whose exploits the series character is based) to help explain why a general reacts to various situations as Armstrong did." Such intense preparation paid off in surprisingly warm reviews. 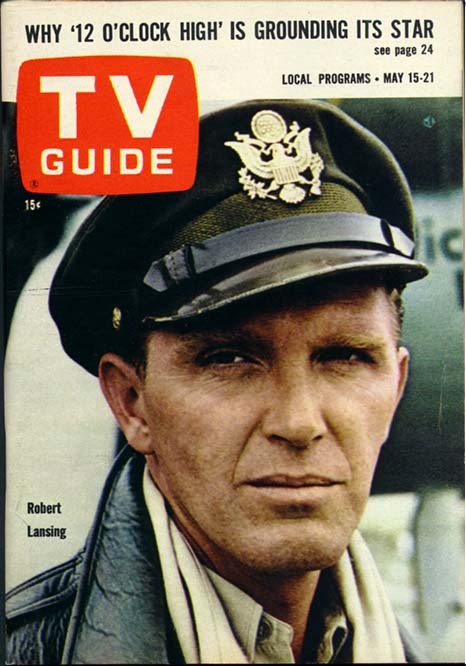 TV GUIDE's Cleveland Amory, who scatters raise as Silas Marner did gold, wrote, "Make no mistake about it, Robert Lansing is magnificent." Others repeated the phrase "dedicated actor" so often that one observer questioned "such singleness of purpose and dedication to the mere art of acting." Replies Lansing: "I don't take myself that seriously - but I do take seriously what I'm doing because it's the way I spend my life." He was born Robert Brown in San Diego at the dawn of the Great Depression and his early years are a kaleidoscopic blur of temporary homes. His father, a charming but impractical young salesman, roamed the southwest pursuing "that big deal." When Bob was 9 the town was Seagraves, Texas. One night he sneaked under a loose flap into a visiting tent show. To escape the realities of his improverished, unrooted home life, the young gate crasher grabbed hungrily at the pleasant make-believe world he saw created onstage - and determined to become an actor. Th next morning, he volunteered for the gramme-school play, then immediately began driving himself with the total-commitment intensity that still carbonates his life. Back in California a few years later. he kept polishing the dream in school plays, charity bazaars, back-yard kids shows, etc. When, as a teen-ager in Los Angles, he learned that he'd have to serve time in the Army, he quit University High School, enlisted, served his two years and started hitchhiking from Los Angeles to Broadway. Stopping in Fort Wayne, Ind., to visit an aunt, he became an actor with the local civic-theater group, a radio announcer and a teen-age husband. Two years later, the Lansings took off for New York. Using his GI-Bill benefits, Robert enrolled at the American Theatre Wing's dramatic school. To the world, the late Forties were a time of prosperity, to the Lansings it was a rerun of the Depression. When funds got so low Bob had to sell a pint of blood for $5 eating money, his wife decided she couldn't take any more. Bob didn't blame her and they're still good friends. Back to the theatrical salt mines, he spent the next year chauffeuring a traveling repertory company's bus 37,00 miles and acting every night after he found a place to park. Their fortunes changed. Cast soon after Bobby's birth as the psychiatrist in the stage version of Tennessee Williams' "SUDDENLY LAST SUMMER," Lansing was named one of that season's two best off-Broadway actors. (The other - George C. Scott.) That success led to his first Hollywood TV part in ALCOA PRESENTS. Lansing's hunger for information - as if to make up for his interrupted formal education - has lead him through groaning shelves of books about archeology, scientific crime detection, wood carving, art, entomology and a dozen other subjects. He has become adept at scuba diving (adept enough to teach it), painting, flying, skiing, horseback riding (to be ready to work in Westerns), and judo (for his role as Detective Carella in the old 87TH PRECINCT series). If Lansing should succeed in movies - sometimes difficult for TV oriented actors - he would gladly bid TV good-by. So if you're eager to see television's only network-designated 10 o'clock actor, catch him in the summer reruns of 12 O'CLOCK HIGH.